This highly desirable Island Packet 485 is fully equipped and ready for cruising. She's completed her recent trip to Central America and her owners are ready to move on to other adventures. Sails and canvas are new in 2016, Lifelines are updgraded to solid stainless steel. She's got a diesel generator, solar panels, wind generator, bow thruster, electric winch, washer/dryer, watermaker, Kato custom Stainless Steel davits, liferaft, dinghy, outboard and so much more. With her seakindly motion at sea, long waterline with good turn of speed for passagemaking and one of the most comfortably liveable interiors of any yacht, she can take you just about anywhere in safety, comfort and style. Call now for your private appointment to see "Hold on Tight" in Sarasota, Florida. This is a preliminary listing and more photos and details will follow. Whether you are planning to buy or sell your next yacht, give me a call and I’ll show you how I will work with you to reach your goals. 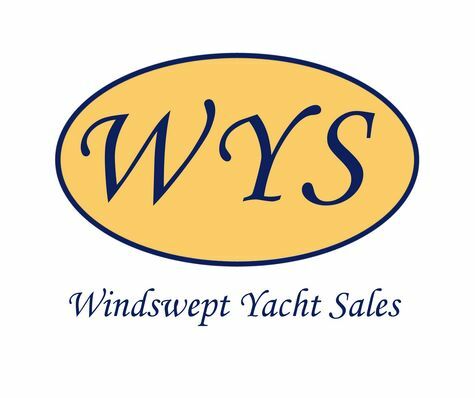 See our website; http://www.windsweptyachtsales.com and take a look at what other satisfied clients are saying about us! For further details please contact Alan Pressman at 941-350-1559 or e-mail inquiries to AlanPWYS@gmail.com. Windswept Yacht Sales gladly cooperates with other Florida licensed yacht brokers on a 50/50 basis for our vessels available for co brokerage. Please contact Alan Pressman at 941-350-1559. Brokers not licensed in Florida, please call for more information. Forward is the large guest VIP stateroom with island berth, and numerous lockers, cabinets, drawers and shelves. To port is a second door providing private access to the forward head to port. The head features a VacuFlush toilet, separate shower stall and Granulon vanity countertop with integrally molded sink. To starboard is the third stateroom which is configured as an office/workshop. The desk top can be converted into a double berth. Aft is the roomy main salon with panoramic views through an array of large windows with custom curtains. To port and starboard are full length UltraLeather settees with the starboard settee convertible to a double berth. Mounted on the forward bulkhead is Island Packet's signature stowable dining table. Aft and to port is the navigation station with high backed swivel armchair, large navigation/chart table with storage beneath, chart storage and a wet locker. To port is the gourmet galley with Corian counter surfaces.The open layout provides ample room for two to work comfortably. The refrigerator and freezer are in separate adjacent compartments, each controlled by individual thermostats. There is a 3-burner LPG stove with oven. Next aft is the owner's stateroom with a queen-sized island berth and plenty of cabinets, lockers, drawers and shelves, as well as a dressing chair to starboard. The private aft head is ensuite and features Granulon countertops with integrally molded sink, VacuFlush toilet and separate walk in shower stall. Peek-A-Boo shades on all ports throughout yacht. The ergonomically designed cockpit features a dedicated bin designed to hold an 8-person valise-pack life raft. Aft of the cockpit is a large deck area that can be used for dinghy storage or as a sundeck. Galley is on centerline and to starboard. Island Packet closed cell foamcore deck. All sails made by Sail Technologies through Knighton Sailmakers. Numerous spares and gear convey with sale of vessel. Docklines, fenders and safety gear included. Owner's personal possessions and tools do not convey.